Perhaps one of the most satisfying feelings in judo is the experience of performing a throwing technique with a minimum of effort and flawless execution. Unfortunately, most judo players rarely experience this feeling. Why is this so? Why is it that many throwing techniques appear to be mechanically correct but require more effort than is necessary? The missing ingredient which answers the above questions in a general sense is that of movement on the part of both players, or more specifically, tempo! A very popular misconception in judo circles is that judo skill is comprised of technique alone. That is, only those physical and mechanical moves which are necessary to move the opponent is thought to comprise the total skill. Nothing could be further from the truth. Technique is only part of the overall skill. The remainder of the skill action is comprised of those movements/actions which take place just prior to reaching the attack point. At this juncture, a definition of those movements/actions prior to reaching the attack point is in order. We have already stated that this is called tempo. However, some qualification is needed since the term tempo is over-simplistic. Tempo consists of those movements made by two players. It can vary from slow to fast. During an attack, the tsukuri action will be part of the tempo. 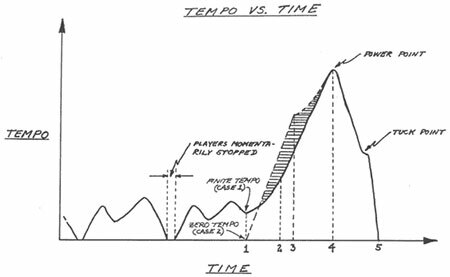 A more precise technical definition of tempo would be the rate of change of expended energy by two players. The writer assumes the reader understands the definition of the tsukuri action made by the attacker. At the end of the tsukuri action the attack point is reached. It is at this point that the attacker fully commits his body weight into the attack. When thetwo players are motionless, the tempo is zero and the tsukuri action must be initiated from this zero tempo condition. To more fully appreciate the value of movement (tempo), we will attempt in a graphical qualitative manner to depict those events which take place in the total skill movement. This will be done for both the case of tempo existing prior to the tsukuri action and a zero tempo condition at the onset of tsukuri. For the purposes of our discussion we shall assume the same attacking technique for the finite and zero tempo conditions prior to the execution to the tsukuri action. The graphical depiction of the foregoing cases are presented in Figure A. 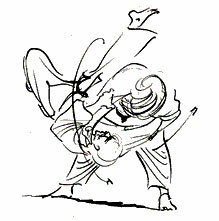 The solid curve (time history) of Figure A is similiar to that presented in G. R. Gleeson's text entitiled "Anatomy of Judo". The writer has introduced a slight modification to this curve. The Gleeson curve always has an absolute value of tempo at any given time. What this means is that the two players are in constant motion. This is virtually impossible. Therefore, those finite times when the two players are motionless have been shown in Figure A by the writer. Superimposed on the modified Gleeson time history is the writer's version of the attack situation from the zero tempo condition. We will now examine the zero tempo attack condition in some detail and make comparisons to the attack with initial tempo. The tsukuri action for the zero tempo case takes place during time increment between points 1 and 3. The attacker must now apply the tsukuri action to a stationary defender. This means he must overcome the dead body weight of the defender. Since no momentum exists the attacker must exert much more effort than that in Case 1 to reach the initiation of "attack movement point," which is point 3. In addition, the application of the tsukuri action will take longer than it would for Case 1. Once the deficiency of the lack of movement has been overcome with the tsukuri action, a tapering off of effort takes place until the common "power point," point 4, is reached. It should be noted that I have chosen to have the maximum power points coincident for the two cases. The choice was somewhat arbitrary but certainly practical. At this point, an astute reader may be wondering why the attacking movement time between points 3 and 4 is shorter than the attacking movement time between points 2 and 4. This is explained by the fact that at the end of the tsukuri action for Case 2, the expended effort or power level reached by the attacker is higher that the corresponding effort exerted for Case 1. A simpler corrolary to explain this phenomenon would be to consider a simple coil spring. Compressing the spring could be equated to the tsukuri action. For Case 2, more compression of the spring is required to complete the tsukuri action than for Case 1. This in turn means that the internally stored energy of the spring is higher (corresponding to Case 2) and therefore the energy release would be greater. This is the physical situation the attacker finds himself in for Case 2. Correspondingly, the attacker can now execute the attacking movement for the same technique in a smaller time interval than for the Case 1 attacking movement interval. To this point in the discussion the reader has probably drawn the conclusion that the Case 1 attack is easier to make against the defender than the Case 2 attack. This, of course, is absolutely true. However, for those individuals more technically oriented we can now carry the included discussion to technical fruition. The area shown under the tempo/time curve in reality represents the amount of work done by the attacker. This being the case, the obvious conclusion is that the smaller the area under the curve the less work done by the attacker. Only that area from the initiation of tsukuri (point 1) and on to impact (point 5) should be considered. Referring to Figure A, the shaded area represents the extra amount of work the attacker must do to make the same throwing technique from the zero tempo condition. Bear in mind that the curves are only qualitative but are representative of the skill movement. The point should be very clear that tempo is required in the overall skill. The contemporary player probably realizes this even intuitively. Intuition is one thing, but a sound scientific explanation of one's intuitive understanding of the subject does far more to increase that understanding. In addition it stimulates one's curiosity for an even further and more comprehensive understanding of what constitutes the overall skill.